Hey CG fans! Sorry for the long delay in posting. We recently made the move from New York to San Francisco and it took us awhile to transition and settle in. But I can see why they call it the Best Coast! I imagine a lot more of my future paleo posts to include produce and vegetables because California has the most amazing supply. In New York, the idea of ‘Farm to Table” dining was getting popular, but being in the Bay Area, I realize now that it’s really just Californian cuisine! Since this is my first post from the Golden State, I wanted to incorporate something from California. So I figured watermelon was the way to go! Fun fact: 75% of total watermelon production is from just five states: California, Florida, Texas, Georgia and Indiana. I thought I’d spicen it up some classic watermelon with some of my favorite flavors so I threw in basil and lime. It’s a great way to get some of your daily Vitamin C as well! 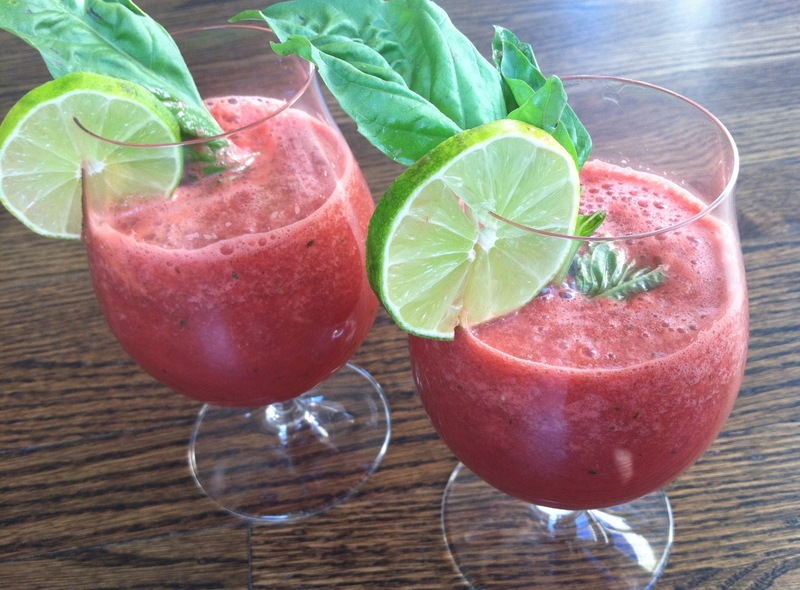 The combination of the sweet watermelon, the tart lime and the savory basil was a surprise hit with my husband. Just like this video – have your guests expect the unexpected with the combination of flavors. This is an easy and tasty paleo way to say cheers! In a blender, add your watermelon, basil and the lime juice (I just squeezed them in by hand). My blender whipped this up in no time. You can add more lime for tartness, more water to neutralize the sweetness or more basil for the kick. This recipe is really forgiving. Easy, breezy. Serve over ice or chilled. Enjoy! Looks great! How many does this serve?